The Courtyard, Ironbridge, Telford, Shropshire. WITH CARPORT PARKING: A well appointed three storey end mews town house situated within the enviable World Heritage Site of the Ironbridge Gorge. Entrance Hallway, Living Room, Kitchen/Diner, Rear Lobby, Cloaks/WC, 3 Bedrooms, En-Suite Shower, House Bathroom, Enclosed Rear Garden, Parking & Carport, EPC Rating: C.
Ironbridge is a renowned and historic area nestling in The Severn Gorge which forms one of the most striking and distinctive landscapes in England, with a charming town centre adjoining the River Severn and the slopes of The Gorge combining a delightful mix of imposing, detached period residences mingling with charming cottages up the hillside. This remarkable area was at the heart of the Industrial Revolution and became world famous in 1779 when the world’s first iron bridge was constructed over the River Severn and from which the town derives its name. It is steeped in the industrial heritage of the area with local museums forming part of the World Heritage Site and is now recognised as a premier tourist area. The Courtyard is situated within the grounds of the Valley Hotel close to the beautiful Dale End Park. Is being sold with the benefit of no upward chain. The accommodation comprises an entrance hallway which gives access to the living room and has a staircase ascending to the first floor. 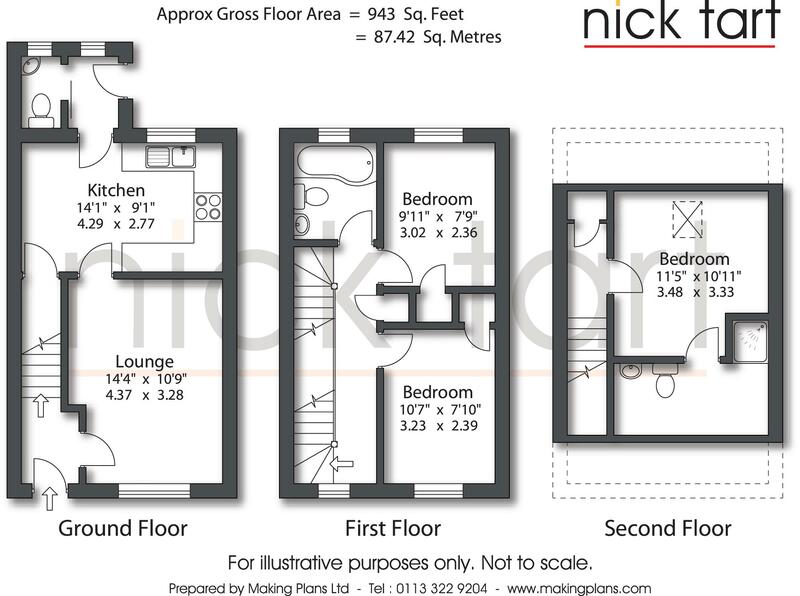 The living room gives access to the open plan kitchen/diner and has an outlook towards the front. The open plan kitchen/diner has a range of base and wall units, integrated oven and hob with extractor hood over, built-in fridge freezer freezer, slim-line dishwasher, concealed wall mounted central heating boiler, useful under stairs store cupboard and tiled flooring which continues through to the rear lobby which gives access to the cloakroom/wc and has a stable door leading to the rear garden. On the first floor there is a landing with useful linen store cupboard, staircase ascending to the second floor master bedroom, access to two bedrooms and house bathroom/wc. Both first floor bedrooms have a built-in wardrobe. The house bathroom/wc has a white suite comprising P shaped bath with shower over, pedestal wash hand basin and low level wc, tiled flooring and part tiled walls. On the second floor there is a small landing area with loft hatch access point, useful store and access to the master bedroom. The master bedroom has an en-suite shower room with white suite comprising shower cubicle, wash hand basin and low level wc. The rear garden has a partly covered paved patio, grassed area, pleasant aspect to the rear and gated pedestrian access at the side leading to the front where there is a paved footpath and small lawn area. At the front there is carport parking. How to get there – for sat nav use postcode TF87EG to The Courtyard where the property is indicated by a Nick Tart for sale board.